From UNESCO website. More than 120 accredited non-governmental organizations (NGOs) as well as States Parties will gather at UNESCO Headquarters on 18 April 2019 to discuss the ways in which NGOs can contribute to the work of safeguarding living heritage. 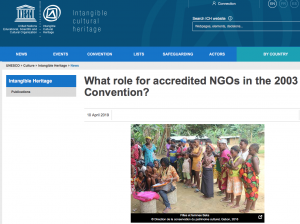 The future of the accreditation system of NGOs in the 2003 Convention – initially established in 2008 – will be at the heart of the debates, including the identification of specific advisory functions, criteria and processes. This consultation meeting will take place as part of the reflection process around the role of accredited NGOs. Read more on UNESCO’s website.